If Shiva is Energy, Why is Shiva (Energy) said to be dancing..? Brahma’s other names are Hiranyagarbah and KAncha. If HiranyGarbha is spacetime, Brahma is Gravity, how do these two match..? Gravity is a force-field. Force-fields are Rudras. But Brahma is not a Rudra. Einstein actually showed that warping or bending of spacetime curvature (HiranyaGarbha) appears as Gravity (Brahma) and Gravity is not a true force-field (Rudra) at all. This is exactly what the Vedas and Puanas say too..
Einstein showed that this spacetime geometry (Hiranyagarbha) of spacetime bending (kA-Ancha) due to energy and momentum is what manifests as Gravity (Brahma). If Brahma the Gravitational force-field is only a manifestation of the bending of spacetime curvature, can Brahma be looked at as a force-field or Rudra..? Yes Gravity (Brahma) can be looked at as a force-field (Rudra) also, as in the newtonian view, as a sub-class of spacetime geometry (Hiranyagarbha). This view is seen in Puranas also. Puranas say Brahma creates a Rudra, when Brahma sees the creation is not going ahead with the manasaputras. Brahma is said to create Vamadeva Rudra. Incidentally I had mapped Vamadeva Rudra to a Gravitational force-field in my blog on Eleven Rudras - Eleven force fields. Thus the bending (ka-ancha) of spacetime curvature (egg shaped Hiranyagarbha) causes the Vamadeva Rudra (Gravitational force field). Movement of Energy (momentum/acceleration) affects spacetime curvature. Spacetime curvature’s warping affects movement of Energy in turn. They are in a continuous dance with each other. We can look at movement of energy (Shiva) in spacetime as a continuous dance. This is the Shiva TAndava that leads to everything. All matter and beings evolve due to the Thandava (dance) of Shiva (Energy) inside the Hiranyagarbha (Spacetime) (arch of flames around Shiva). Like a swan/goose that moves in water producing silent waves around, when the bending of spacetime happens due to energy, it produces waves in the spacetime. These are called Gravitational waves. Hence Gravity or Brahma is pictured as mounted on a Swan. As energetic objects (Shiva) dance in (accelerate/move in) the Hiranyagarbha (spacetime) affecting each other, ‘Brahma (Gravity) keeps moving in a swan’. It means gravitational waves keep travelling across all around due to movement of energy (and the bending caused). This movement is also similar to the picturization of "Brahma in a swan trying to find the start or end of Shiva and not finding it', as spacetime is filled with gravitational waves all over. 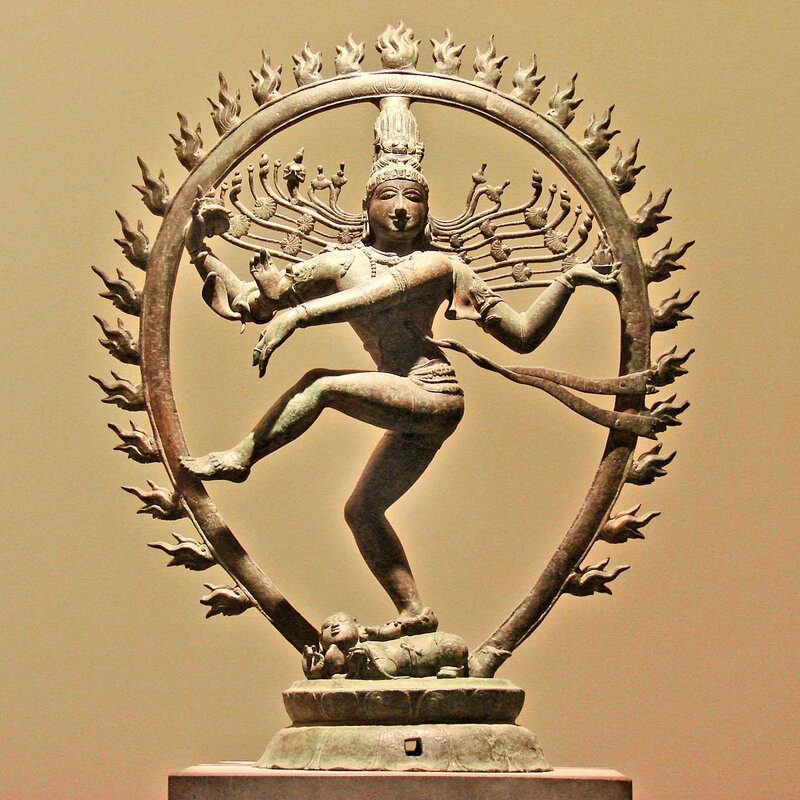 While the dance (Thandava) of Shiva (Energy) in spacetime being a fundamental pattern of our evolution is a scientific fact, the depiction of this pattern in an idol of Nataraja is philosophical. Philosophies in general indicate a pattern based on science, but do not refer to specific facts. Creation (Srshti) is indicated by the serpent around the waist that is said to represent kundalini. Stabilization (Sthithi) is indicated by the steady foot on the Apsmara. Contraction/Destruction (saMhAra) is indicated by the raised left foot that is bent/contracted. Disappearance after contraction (tirobhAva) is indicated by the left hand pointing to the raised left foot. Facilitation/promotion to next levels (anugraha) is indicated by the right hand. The whole cycle of evolution (Brahman) is due to this dance of Energy (shiva) in the spacetime. In this dance of energy (Shiva), force-fields (Rudras) of Vibrations (drum) are produced, transfer of Energy/exchange of forces are produced (Agni). 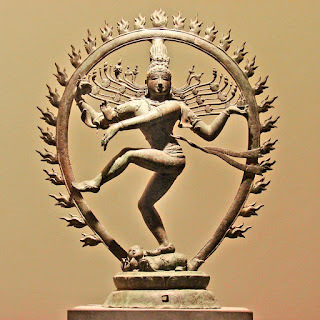 The circular or elliptical frame around Nataraja symbolizes the Hiranyagarbha or spacetime. The flames in that frame may be symbolizing the gravitational waves. This is just a mere imagination. This dance of Shiva (Energy) happens on apasmara, who looks downwards. Apa-smara means off-memory or memory loss or loss of remembrance. We can call it our ignorance. But it just means ‘beings’ lose their remembrance on the Thandava (dance) of Shiva (Energy), from which they came and keep looking downwards. They cannot look up and understand this dance of energy in the spacetime.